Home Best Jumping Media Press Release Shane Breen added more at the Longines Accumulator in Dubai. Shane Breen added more at the Longines Accumulator in Dubai. Irish rider Shane Breen led the one-two for his country by winning the €28,700 Longines Accumulator at the CSI5* Dubai conclusion. Representing the final of the CSI5* FEI World Cup – Arab League – Emirates Equestrian Club Dubai and main protagonism of the Irish riders, Shane Breen accompanied by the 12-year-old stallion Can Ya Makan (Canturo x Fara) owned by Team Z7, completed their round in 65 points and time of 49.22 seconds to ensure the victory and 50 World Ranking points. 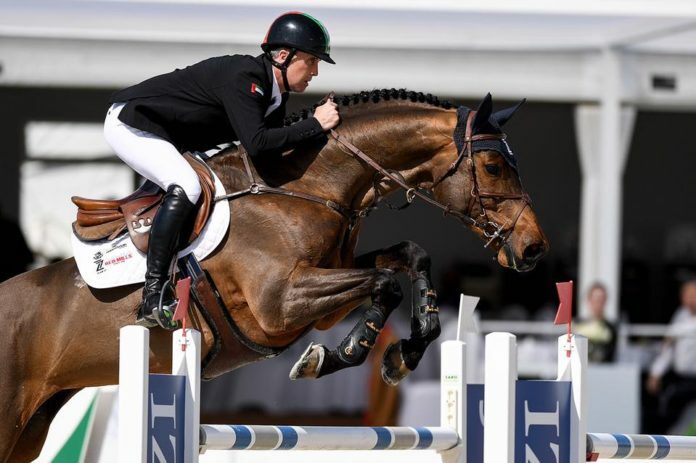 The Irish one-two came with Shane Breen in first place and David Simpson escorting him in second place with 11-year-old stallion Unex Cognac IV (Unaniem x Kennedy) accumulating 65 points in 50.96 seconds. The rider who finished accumulating 65 points extended to ninth place on course designed by British Robert Ellis, being in third place Ramzy Al Duhami of Saudi Arabia with the 11-year old gelding High Quality J (Quadrillo x Nabab de Reve) in time of 52.73 seconds, closing the top five ranked Amre Hacho of Syria in fourth place with 15-year-old gelding Al Murtajz (Pilgrim x Capitol I) in 53.41 seconds and fifth Vladimir Tuganov of Russia with the 14-year-old gelding Confident of Victory (Cornet Obolensky x Damokles) in 53.60 seconds. By Latin Ranking Luiz Felipe de Azevedo Filho of Brazil accumulated 25 points in his round and a time of 49.58 seconds with the 12-year-old stallion Chacito (Chacco-Blue x Daimler), being out of the World Ranking points in 22nd place. For its part and also forming part of the Pan American Ranking Alice Debany Clergy of the United States, registered the same 25 points accumulated ranked 27th with the 13-year-old mare Amareusa S (Baloubet du Rouet x Le Mexico). Previous articleArturo Parada dominates the second FEI class of the CSI2* Guadalajara. Next articleChristian Ahlmann and Ailina superior at the Championat of Leipzig.